You are here: Home » GENRE » Science » Bering Sea meteor strike last Christmas could have destroyed New York and killed 20 million. Bering Sea meteor strike last Christmas could have destroyed New York and killed 20 million. Last December (2018), an untracked and rather unexpected meteor exploded over the Bering Sea releasing 173 kilotons of energy, or more than ten times the energy of the Hiroshima atomic bomb blast. To put this event in context, if this meteor came in on a less fortunate angle and hadn’t air-burst, but instead struck the middle of New York, it would have left a ring of devastation reaching as far as Philadelphia, Springfield, and Scranton, with an estimated twenty million left dead and another 40 million injured. Even an air-burst event as high as 15km above ground-level can cause serious damage and injuries. The 2013 Chelyabinsk meteor air-burst damaged over 7000 buildings in Russia and led to 1,500 people being taken to hospital with largely shrapnel-style injuries from blown-in windows and a few collapsing walls. 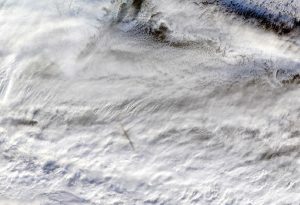 NASA’s Terra satellite caught the image of the unexpected meteor strike, showing the shadow of the meteor’s trail, and the orange-tinted cloud it left behind. NASA have just released images of the strike. The Terra spacecraft was launched in 1999 and is managed by NASA’s Goddard Space Flight Center in Greenbelt, Maryland. Given the meteor’s altitude and the remote area over which it occurred, the object thankfully posed no threat to anyone on Earth – this time. These days, I suppose we should pose that question to Jeff Bezos and Elon Musk. Come on Space Force, here’s the real enemy for you to take on. We need a ring of detection satellites, the entire solar system mapped for the 70% of ELE-capable space debris we haven’t yet found, and an array of solar-reflecting mirrors to nudge danger-hot rocks off course years before they pose a risk. Earth death by meteor… NASA fights back. « Motorbike that transforms into flying jet bike, S.H.I.E.L.D.-style.